Mariam Toppo, a 61-year-old woman from a tribal community who lives with her children and husband at Kutialerbose village in Petla Gram Panchayat of West Bengal’s Coochbehar district. Along with 62 other families, Toppo’s family has been living in the village for decades but they did not have any land records. Not only were these families living in the fear of eviction, but they were not able to get the benefits of various government schemes. They had tried to apply for land records but did not succeed in acquiring them. Mariam came to know about Pramila Bahini (Women’s Brigade), a collective of marginalised women formed with support GitaldahBikashSamity (Gitaldah Development Society), an ally of ActionAid India, which is working for securing rights of women. 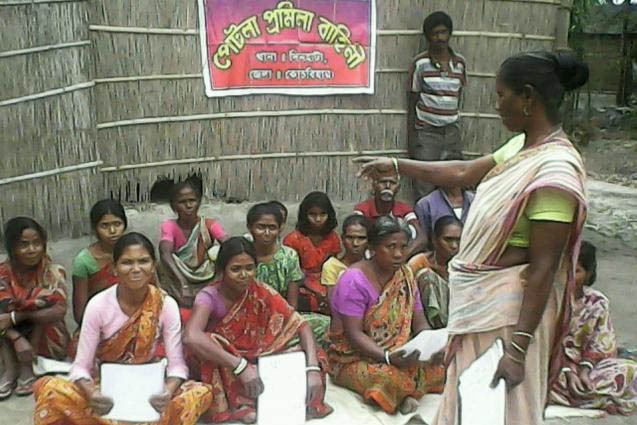 With over 8000 members, Pramila Bahini is spread across 72 villages of Coochbehar district. Mariam contacted Pramila Bahini and also mobilised her fellow women to join the collective. Mariam took the initiative, and under her leadership the group applied for land and made continuous follow ups with the local land and revenue authorities under the guidance of Pramila Bahini and Gitaldah Bikash Samity. Simultaneously Mariam started working towards establishing the community’s access to Government schemes including employment through the Mahatma Gandhi National Rural Employment Guarantee Act (MGNREGA) and widow and old age pension. Because of the efforts of the women, villagers began demanding work under MGNREGA. However neither the local Panchayat, nor the Block Development Officer (BDO) could allot work to them. The women’s group then went to the District Nodal Officer of MGNREGA and with his help, villagers of Kutialerbosh got 14 days of work for the first time. Mariam was however not very happy as their efforts towards land entitlement was not getting any result. In 2015, Mariam and her fellow village women formed another group called Petla Adibasi Bhumihin Samity aimed at making fresh application for land titles under the aegis of a formal entity. This time, the administration took up their case with priority. The process got further accelerated when the Additional District Magistrate of Coochbehar was informed about the issue during a visit to their village. In December 2015, names of the applicants were notified for land title (patta) under Nijo Griho Nijo Bhumi (Own home, own land) scheme for homestead landless. Finally in February 2016, 26 landless families of her village received land patta in the first lot. The whole village celebrated the success of Mariam Toppo. But Mariam’s struggle has not finished yet. She is still fighting for ensuring entitlements for both homestead and agricultural land for rest of the families. “Today, women are being respected. It was because of our constant efforts, land titles have been received by these families that to in the joint name of their spouses,” says Mariam. Mariam has currently taken up her fight against social menaces such as child marriage, human trafficking, violence against women, children’s education among others. To ensure that no child, boy or girl, gets dropped out of school, Mariam and her group are constantly engaging with parents, especially of the migrating families. Mariam has now become a role model for the entire community. What people admire in her is the fact that in spite of all odds in her life like poverty, landlessness, social exclusion and even old age, she is living a life dedicated to the wellbeing of others.